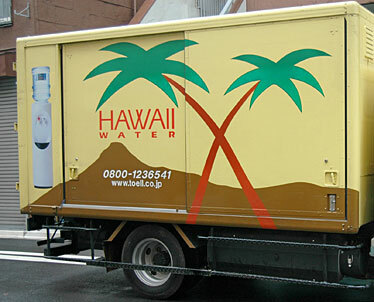 Roger Kobayashi encountered a Hawaii Water truck in Asakusa, Japan, about a block from the Kaminarimon, Thunder Gate. 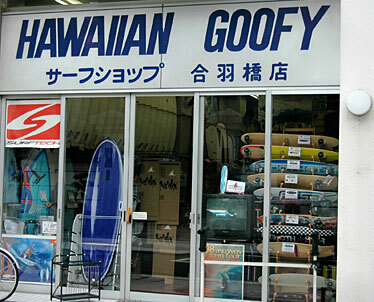 He also spotted the Hawaiian Goofy surf shop, below, on a quiet back street a few blocks from the Ueno Train Station. 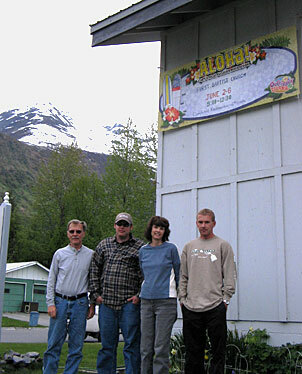 With the last snow of the season still visible on the slopes, the Whitaker family - Tom, left, Brandon, Dorothy and Curtis - posed in front of the banner for the First Baptist Church in Valdez, Alaska, advertising the congregation's Hawaii-themed vacation Bible school.